At Easter we celebrate the blessed assurance of Christ’s resurrection, which according to Paul is the first fruits of a harvest that leads to the death of death. Living as we do in a scientifically sophisticated world, there are many reasons to cast doubt on this long held belief in an afterlife. As David Hume was known to say, where is the evidence that dead people rise? (my paraphrase). Hume was fond of pointing out that dead people rarely if ever come back to life. Yes, there are those Near Death Experiences that some want to use as proof (or at least that’s what a spate of recent books would have us believe), but is this really proof? Since resurrection isn’t part of our normal experience, why should we trust statements made nearly two thousand years ago? Is there enough to go on to even act in faith? Despite the many challenges, the Christian community continues to celebrate the sacred event of Easter (Resurrection Day). While some celebrate with few if any doubts, many who gather for the celebration do have their questions. So, whether we come ready to embrace the entirety of the story or not, is it possible for us to embrace the life-changing message of resurrection? And for those of us who preach, can we do so without becoming complacent in our own proclamation. Are we ready to hear something new in a story we’ve been rehearsing, possibly for years? As we begin our celebration, the first word we hear comes to us from Isaiah 65. 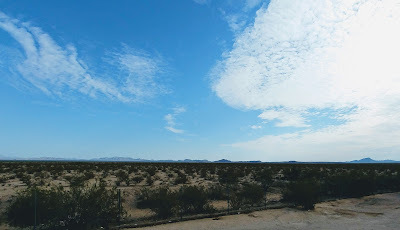 Likely emerging out of the post-exilic period, after Cyrus had released the captives and Israel could begin to hope for a new day, this word promises a new heaven and a new earth. The painful memories of their captivity can now give way to a new day, when Jerusalem will again be place of great joy and gladness. In this new age there will be no need for weeping and crying. The sting of death seems to have been removed. Even if death doesn’t appear to be completely eliminated, the life span will be almost eternal. At the very least, no longer will babies live for just a few days – infant mortality will be a thing of the past. Indeed, if one passes on at age one hundred, that will be way too soon. Beyond this promise, in this new age, people will build their own houses and live in them; they’ll plant vineyards and eat the fruit of the vine. In this new age of abundance, there will be enough for all to enjoy the blessings of life. And in a truly eschatological manner, we can look forward to watching as the wolf and lamb graze together, while the lion eats straw. The day of predation is over. Unfortunately for the snake, it will eat dust (but then the snake has gotten a bad reputation). In this vision we seem to be returning to Eden, to a utopian vision of equality and blessing. This vision is powerful, but it can be dangerous. So, we must treat it with great care. Trying to “restore” Eden could lead us astray, unless we keep focused on the guidance of the Spirit. Isaiah promises a new eschatological age of abundance and peace. In the Christian proclamation, that eschatological message is caught up in the promise of resurrection. With the resurrection, we see the triumph of life over death. For Paul, everything hinges on the resurrection. If Christ has not been raised, then our proclamation is in vain, we are without hope, and thus deserving of pity for our adherence to such an unfruitful belief. Paul doesn’t neglect the cross, but without resurrection death triumphs. Paul is unwilling to let that occur. Paul isn’t offering a stoic embrace of suffering – he looks forward to seeing death lose its grip and its sting, and that can only happen if life reigns triumphant. Paul links the resurrection of humanity to that of Christ, who is the first fruit of the harvest. If we belong to Christ, then we will share in his resurrection. In him we die and rise again, when the last enemy – death – is defeated. Then God will be all in all. Paul’s message has a cosmic tone. He places the resurrection at the center of a cosmic battle that pits the power of death against the power of life. It would seem that to this point death has had the upper hand, but the day is coming – signaled by the resurrection – when the tide will be turned. Death will not have the last say. Instead, life will prevail. So the question then becomes – how do we respond? If God is on the side of life, what side should we be on? I realize that any conversation about life and death has political and cultural attachments. In our culture to be pro-life is to be anti-abortion. But surely to be pro-life is a much broader category. I will confess to my own ambivalence on the question of abortion, but does not the message of resurrection suggest that life is sacred and precious? It isn’t that we should prevent death at all costs – leaving people on machines for years on end (Teri Schiavo) – but that we should seek to end war and work to enhance the quality of life for all people. It is interesting to me that some who oppose the biological theory of evolution have no problem supporting laissez-faire capitalism, which is an expression of Social Darwinism. Is such a vision truly pro-life? Paul asks us to consider what it means to live in the power of the resurrection. What difference does it make? When we gather for Easter, we look forward to hearing the story of resurrection as told by the Gospel writers. Each Gospel narrates the resurrection story in different fashion. But they are in agreement on this – on the first day of the week the tomb was empty. The stone had been rolled away, the body was gone. What then is the meaning of this revelation? 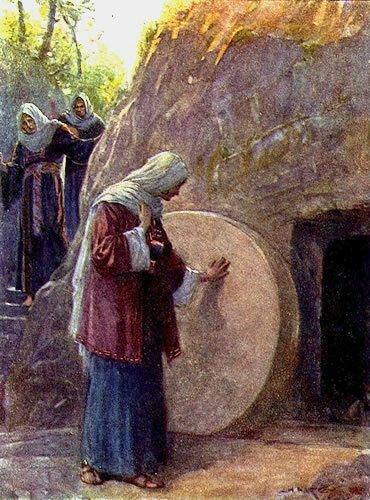 In Luke’s telling of the story, “the women” go to the tomb. They don’t go in expectation of resurrection, but expecting to anoint the body of Jesus for burial. They go to the tomb expecting to find a body. Whatever Jesus may have said about resurrection, it hadn’t sunk in – at least not until two men (angels) in dazzling clothes brought the promise of their resurrection to their attention. The men ask a pointed question: Why are you seeking the living among the dead? Then they answer the question that must have been on the minds of the women who find the tomb empty – “He’s not here, but has been raised.” To further prod their own experiences of Jesus’ teaching they’re directed back to what Jesus had taught them – in the form of a faith confession: the son of man (human one) would be handed over, crucified, and on the third day rise again. Don’t you remember? Obviously not! Resurrection, in other words, throws off the balance, upsets the apple cart, and generally turns our neat and orderly lives totally out of whack. Which is why I think that if you don’t find resurrection at least a little hard to believe, you probably aren’t taking it very seriously! Unfortunately, for most of us who know this story well, we don’t even blink at its seeming implausibility. But in doing so, we fail to let the story shape our vision of God and the world. Of course, Luke does say that Peter ran to the tomb to check it out, so maybe he wanted the story to be true -- and when he found the tomb empty he returned home wondering -- as do we! Whether or not we’re troubled by the idea that Jesus might expect resurrection, are we ready to embrace the message of life? Are we content seeking the living among the dead? Or are we ready to envision a new cosmic reality, where life triumphs over death? Are we ready to let the message of resurrection transform the way we live in the world? Are we willing to let the stones speak to us of God’s message of transformation through the stone that has been rolled away from the door of the tomb? In other words, are you ready to enter the new age of resurrection -- the age when God's realm embraces us all?